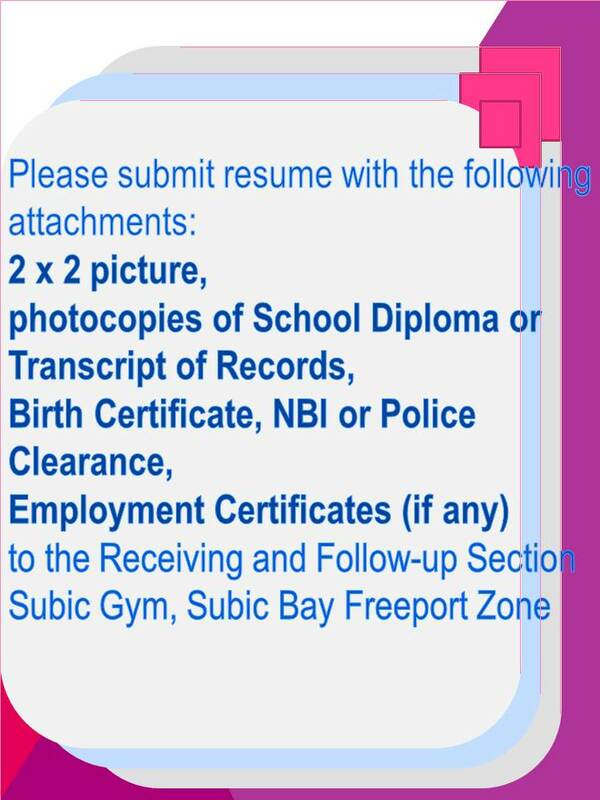 A bachelor’s degree holder, preferably BS of Engineering courses or Business course; Experience in an industrial firm is an advantage; Must have adequate knowledge and experience in PRODUCTION PLANNING and SCHEDULING; Experience in ISO procedures is an advantage; Must be computer literate (EXCEL, WINDOWS and POWERPOINT); Decisive with excellent oral and written communication skills; Flexible, aggressive, hardworking and willing to extend long hours. A Registered Nurse; Preferably has OCCUPATIONAL SAFETY and HEALTH (OSH) training (at least 40 hours); With two(2) to three(3) years related work experience in a hospital or industrial setting; With above average oral and written communication skills; Well knowledgeable in first aid and emergency treatment; Must be willing to accept shifting schedule. A bachelor’s degree holder, preferably BS in Industrial Engineering, Mechanical Engineering, Electrical Engineering or other engineering fields; Experience in manufacturing and technical process in an industrial firm is an advantage; With knowledge in machine settings and can perform maintenance of machines; With knowledge in electrical equipment and can read electrical diagram; Experience in QUALITY and PRODUCTION PLANNING is an advantage; Experience in ISO procedures is an advantage; Must be computer literate; Knowledge in AUTOCAD is an advantage; Newly graduates are welcome to apply; Patient, hardworking and with initiative. Female; Preferably a graduate of any 4 year course; With at least 6 months of office works experience; Must possess excellent ENGLISH communication skills; Must be friendly, approachable, and patient. Male; College level; Preferably can operate forklift and has Driver’s License; Basic knowledge in warehousing / inventory control; Computer literate; Good communication skills. Male / Female; Preferably graduate of BS Nursing; Has acquired BOSH Certificate.